When you’ve been driving around the United States for a couple hours, visiting all the 242 country landmarks, do you get a sense of overwhelming joy, wonder, or fatigue? The Crew in one word: expansive. On its own, it’s a decent racer, featuring a wide array of vehicles from many different brands and classes. It also displays a huge map of a contiguous United States. The world is massive, open, and persistent, for both racing, and free-roaming. As a multiplayer racer, it enjoys its always-online connection, reinforcing the idea that this game should not be played alone. When the game Fuel was released, the map was colossal. One could probably claim that it was too big. It was mountainous and rocky and barren of anything interesting. Hardly any roads and terrain that wasn’t really fun to drive on. Forza Horizon 2 was immense as well, featuring highways, and forests, and farming fields, and a scaled down version of some of the popular European destinations. Test Drive Unlimited 2 brought us to Hawaii and Ibiza, full coverage of the two islands, landscape and cities. The Crew brings these similar concepts, however this time, of an authentic re-creation of the major cities across the United States. 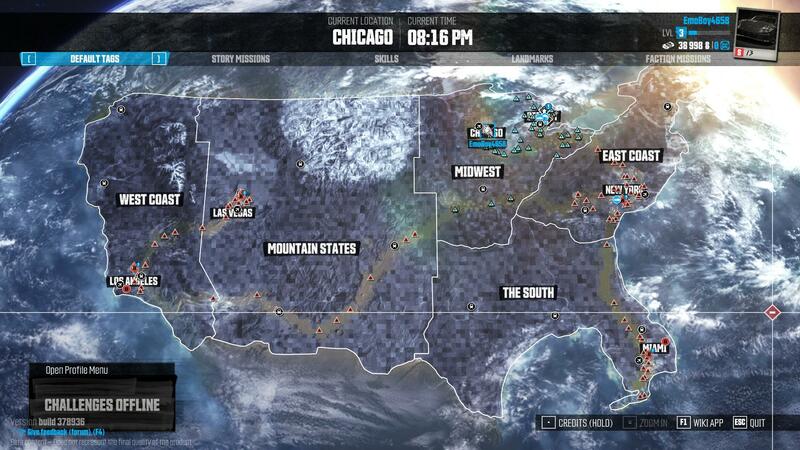 The map is broken up into 5 regions: The Midwest, East Coast, Mountain States, West Coast and The South. Each region has 1-2 main cities, various other large cities, and then 30 odd, smaller cities and towns spread out. All the major US landmarks are view-able, and attainable as collectibles. The game map takes approximately 45 minutes, in real world time, to cross from coast to coast, depending on your vehicle of choice. Some of the races themselves may even net you a 2-3 hours dedicated game session, as they take you on a tour of the US. The map is filled with landmarks to visit, hidden busted up car parts to collect, satellite towers to unlock, and pedestrians and wildlife aplenty to swerve around, as you weave in and out of oncoming traffic. From coast to coast, the world is also littered with challenges. These are little mini games to help unlock upgrades for your respective vehicles: Drive fast while on the road, drive through the marked gates, slalom, jump distance, etc. Each has a bronze, silver, gold and platinum trophy and unlocks car parts. And each of these challenges just requires the vehicle to drive through the marked zone to initiate. Then the only loading is when you equip the part after it’s won. The seamlessness is appreciated. Each region of the map is the home to its specific class of car, and these are unlocked as we progress through the story. 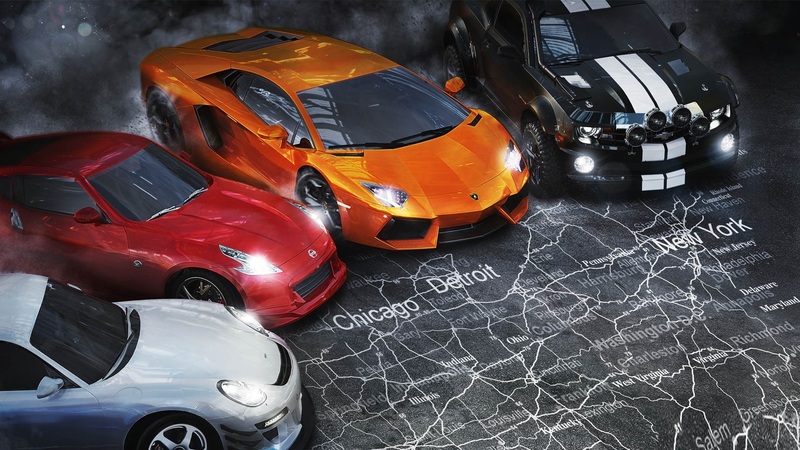 Each major city has its own Garage, Tuner, and Showroom for buying new cars. The Story of The Crew is commonplace to any typical driving game or driving movie: a family member is killed, and you need to infiltrate the ranks of the rival street gang to ruin their day and potentially get revenge for your family. It’s tired and predictable. Need For Speed in a nutshell. Our protagonist, Alex Taylor, looks like Morgan Freeman. He’s a street racer, as is our older brother, Dayton, big surprise. Our brother is the leader of the 5-10 motor club. I guess street racers don’t hold down real jobs anymore. After winning a race, hanging out by our cars, our brother is shot by an eager up-and-comer, wanting to move up the ranks. As our brother dies in our arms, in the middle of the street, the mysterious driver gets away, and the police arrive, suspecting us of the killing, and we get put in jail for 5 years by a crooked FBI agent. After 5 years, we get released by another FBI agent, a new face, incorruptible probably. She knows that we were put away wrongly, and has given us the task of tracking down our brother’s killer, the new leader of the 5-10 motor club and the crooked FBI agent, in return for our freedom. All we have to do is infiltrate the ranks, and work our way up through the 5-10 motor club, and get a few permanent tattoos along the way. The deal is that we get our brother’s killer; she gets the crooked FBI agent. Everyone is happy. What follows is about a 20 hour campaign, working our way through the 5-10 ranks through a series of races, starting in the Midwest, in Detroit, progressing down to The Big Apple, across through The South, all the way to The West Coast, Los Angeles. We start with a functioning car, upgrade it for off-road Dirt races, then Raid class, advance onto Perf, then Street, and finally Circuit. Race types include: A to B style races, checkpoint, lapped races, and even some collection style races. We meet many different allies, and bad guys along the way, and have to out-run the cops, to remind us that street racing is illegal. But in the end, we finally meet up with our brother’s killer, force him to crash his car, and let the police take him down. The visuals of the game are impressive, considering the scope of the game. Cars are detailed inside and out, and the map is alive with pedestrians and civilian cars in the city, and many different kinds of wildlife outside. Luckily a lot of the environment is destructible. The one downside of Test Drive Unlimited 2 was its indestructible fences and lamp posts. Luckily The Crew fixed this, as all poles and fences can be driven through without much friction. As mentioned already, the map is large and very diverse, with a full day and night cycle, so it is a joy to drive across the large expanse of country side. The Tuner shop features a very robust car detailing and upgrades section. This area will allow you to modify the car parts currently assigned, as well as style, colour, and body mods to each. These are all purchased with in-game currency which is earned through races and challenges. All this, and the game functions with very minimal loading, which is a blessing. When accessing the map, the zoom feature allows you a view right down on top of your car and shows a real-time view of the streets, down to the minor details of any recent tread marks left in your wake, and any crew member who happens to be doing donuts around you. The map also allows the player to fast travel to anywhere they’ve already been, and with only seconds of loading. That said, the frustrations start to pop up as we try to work within the menu structures. It’s not always readily apparent where to find information about factions, or challenges, or what winning Reputation even means. And trying to access the in-game start menu is all through a cell phone that houses the games settings, vehicle changer, and radio. All of this, while driving? Don’t text and drive kids! Lastly, the multiplayer and co-op components are what make The Crew worth picking up. Test Drive Unlimited 2, and to an extent, the Forza Horizons twins, introduced us to a social, persistent driving game, where you could road trip with friends. The Crew takes these ideas and puts some weight behind them. Your crew supports up to 4 drivers, including you, and with these friends, you can enjoy the full campaign, as well as PvP events. The co-op crew functionality includes a shared waypoint indicator for meet-ups, and everyone will be able to participate in campaign events and faction missions. You can also see your friend’s location on the map, and on the horizon. Only downside is you can’t challenge your friends to any spontaneous point-to-point races like some other online racers. The shared multiplayer world hosts 5 factions. You choose one, and all faction races you take part in will benefit the overall community experience handed out daily. Sort of like a global competition. Faction choice can be changed at will, but not constantly, as there is a delay before switching again. “-HOW LONG BEFORE WE STOP? The multiplayer also supports PvP free-for-all and crew vs crew. The online community, sadly, is lacking, so it might be difficult to find races consistently. All the campaign races, challenges, and faction events can be replayed endlessly to get a better ratings and trophies. Once the player reaches the level cap of 50, the platinum trophy is unlocked, and this will provide huge boosts to your car parts. 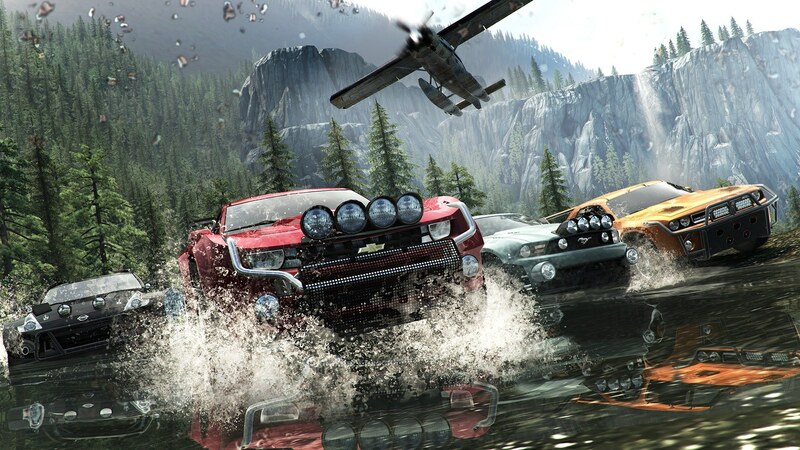 Overall, the crew is a worthy driving game contender. Its map is huge, diverse, and robust with distractions (last bit a staple with all Ubisoft games). It’s satisfying as a racer, if not a little frustrating sometimes with its forceful ground magnets ensuring your vehicle is always right side up, to the sacrifice of any semblance of control, on occasion. Challenge menus, settings, and map quirks aside, the co-op element make up for the shortcomings, and ensures that any friends are welcome to come along for the ride. Achievements aplenty, but these are mainly collectibles. Finding all the landmarks, hidden cars, or getting gold on the 500 skill challenges. Drive forever in one car? Blegh. Give me those multi-hour races, test-driving expensive cars, or breaking sound barriers on the Salt Flats. Thanks. This entry was posted in Reviews and tagged Forza Horizons, Games, Gaming, review, Test Drive Unlimited, The Crew, Ubisoft, Video Games. Bookmark the permalink.